Last Mother's day, Alaska sent me a humongous basket containing their products. I was shocked because it's not the usual package. It was packaged in a super usable basket and came with Te Amo Floristeria custom preserved arrangement. Alaska surely knows how to make Mother's day extra especial with their blogger mail. To celebrate National #BelatedMothersDay, Alaska made an online film starring a mother who works as a spa attendant.She comes home to a surprise the day after Mother’sDay. 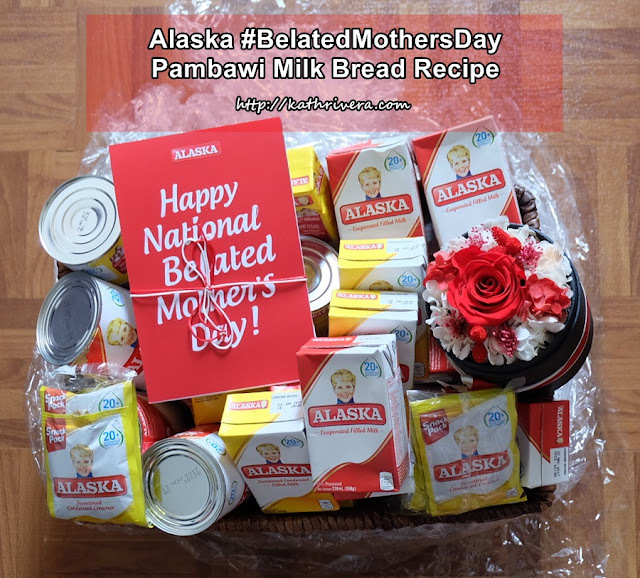 Families with busy moms can celebrate National #BelatedMothersDay by preparing their mom a simple dish using Alaska Sweetened Condensed Milk or Alaska Evaporated Milk. Sharing with you simple recipe from Alaska after the jump! I received recipe cards together with the Alaska Mother's Day Gift but was not able to share the recipe last month. Moms are busy and if you're a hands-on mom like me, you'll feel what I'm saying here. But before sharing the recipe, let me introduce to you some of Alaska's products- Alaska Sweetened Condensed Milk and Alaska Evaporated Milk available in can and tetra pack. Alaska has featured recipes, like Pahabol Braised Pork, May Time Pa Macaroni, Belated Banana Apple Shake, and Pambawi Milk Bread. By offering simple recipes, Alaska makes it easy for families to honor their moms through delicious food. Combine eggs, ALASKA Evaporated Filled Milk, vanilla and cinnamon together in a small bowl. Whisk ingredients until mixed completely. Dip bread in mixture and cover completely in liquid. Add about 1/2 T butter to skillet and let melt. Place bread in skillet, two at a time, and let cook until browned. Flip and cook other side. Drizzle with ALASKA Sweetened Condensed Filled Milk. Tada! French toast, Alaska way! This recipe is so easy to make. Perfect for breakfast and merienda. Kids and those who have sweet tooth will love this Pambawi Milk Bread. Thank you so much, Alaska Philippines for remembering me and my family on Mother's Day. We can now celebrate Mother's Day any time we want as long as there's an Alaska Milk to make dishes healthy and delicious!